Futuristic elegance. Our globo boxes are an intriguing addition to any tabletop, powder room, or cocktail table. The polished brass base lined in turquoise velvet complements a gem-esque Lucite lid. Sold as a set including three sizes. Contact Dealer for additional color options. Measures: Small: 4 in. D x 4.63 in. H Medium: 6 in. D x 5.38 in. H Large: 9 in. W x 5 in. D x 5.75 in. H.
Potter, designer, and author Jonathan Adler launched his namesake brand after leaving his day job to pursue his first love: pottery. In 1993, Barneys bought his collection of pots, and five years later, he opened his first store in Soho. Soon, his design desires expanded. Creating a few innocent throw pillows evolved into designing sofas to designing the side tables that flanked them, then the lamps to light it all…and so on. Now his offerings span furniture, lighting, home accessories, decorative objects, tabletop collections, bedding, bath accessories, candles, rugs, pillows, and more. 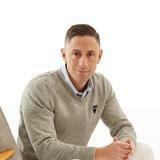 His eponymous company has stores worldwide, a thriving e-commerce site, a full slate of residential and commercial projects, and a wholesale business boasting over 1,000 locations globally. Original Mid-Century Modern Lucite and brass box by Gabriella Crespi, Italy. Marked on the brass. 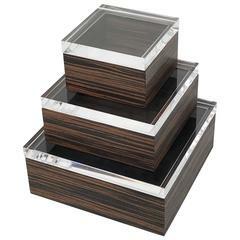 Set of three Macassar Ebony and Lucite jewelry boxes. Measures: Large box 9"by 9" by 3.75". Medium 7" by 7" by 3.25". Small 5" by 5" by 3.25". 1970s chrome and Lucite box Good vintage condition. This stylish box was created by Maitland Smith and dates to the 1980s. 1970s elegant Lucite and brass box. Great vintage condition. Jewel case. Box in Lucite. Tortoise plexiglass and brass. Christian Dior style, 1970. 1970s modernist box in Lucite and lacquered wood.